It's time to team up and go hunt some of Final Fantasy's most iconic creatures. There's not a lot of plot to Final Fantasy Explorers. You make a character, come to the one town on a remote island, and receive quests from its inhabitants. The island itself is a macrocosm of our world, filled with everything from grassy plains and snow-capped peaks to volcanic caves and untouched beaches. And in all of these places are monsters—monsters you are likely to recognize from other Final Fantasy titles. Chocobos, Cactuars, Tonberries, and many more roam the island—just waiting to fall before you. When you kill them, you get various materials you can then use to make new weapons and armor. Occasionally, you'll instead receive the monster's soul and are able to resurrect said monster and add it to your party . But these are just the fodder monsters. The game also sports many bosses to hunt, including the various summon monsters that have been reoccurring fixtures of the franchise at large. When killing these, it is even possible to capture them—and while they don't join your party, you are able to use their powerful attacks in battle. Like several past Final Fantasy titles, Explorers features a robust job class system. Everything you'd expect to see is there from classics like black mage and white mage, to rarer ones like paladin and ninja. There are a total of 20 of these jobs that unlock as you progress through the game's quests or meet other in-game requirements. These classes can be changed for no cost in the hub town. While each class is distinct with its own specific attacks and spells, some classes are able to use other classes’ skills—though this is dependent on the weapon. For example, a dark knight is able to use the skills of a warrior as both use a long sword. However, if that same dark knight were wielding an axe, the warrior skills would be unavailable. All this, plus the various weapons and accessories, gives the game a ton of customization. Like Monster Hunter, Explorers is clearly a game built for co-op. The game can be played with four players locally or over the internet, with the co-op players replacing the single player game's monster companions. It's simple to pick up and play—the team leader selects a mission, goes to the airship port, selects where the mission will begin, and then you go. It's as simple as that. The only noticeable downside I saw in multiplayer was that there was more than a bit of graphics slowdown when four players and a boss were all spamming their colorful, explosive special attacks. Still, that did little to diminish the fun. While the teamwork and monster killing is enjoyable, perhaps the best part of multiplayer is getting to try out all the jobs you've unlocked—and still being able to progress through the main quests thanks to your companions. That's not really the case in single player. When playing single player, most job classes are simply not practical for most quests. While all the classes have their strong points, bosses will easily tear through even the best armor in one or two hits. And as the monster companions aren't exactly the most resilient or the best at healing, it is a necessity to be a class with some sort of guard ability. This means you are relegated to playing a tank class. And while tank classes are fun in their own way and have a fair amount of variety all their own, it's disappointing to know that you can't really be effective with most of the other classes unless you play online. The most annoying part of Final Fantasy Explorers is lag—and not online lag, but rather interface lag. You see, in Explorers, your special skills (i.e., any skill other than a basic attack) are linked to a special menu. To open this menu, you press and hold one of the shoulder buttons. Between pressing the button and the menu opening, there is a noticeable pause; and if you press your follow-up button too quickly, the input is dropped. While this may not seem to be much as first, remember that block is one of these special skills. And when most bosses have at least one one-hit kill in their repertoire, being able to block it is a necessity—especially in single player where you'll likely be the tank. 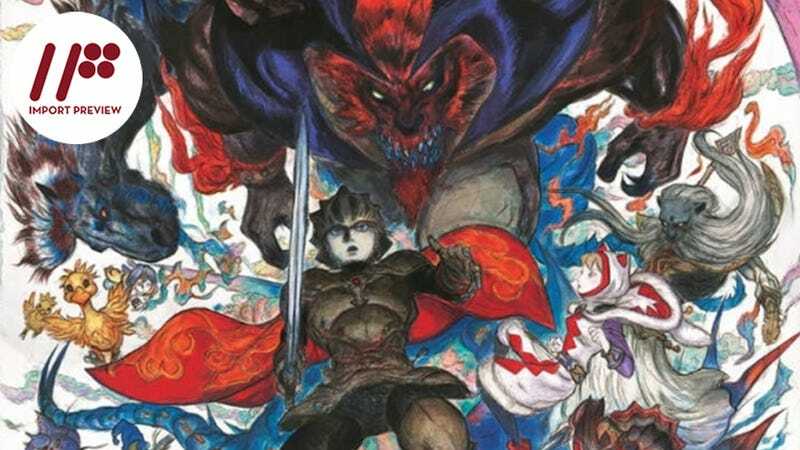 Final Fantasy Explorers is a game made for two kinds of people: those who love the endless grind of getting loot, crafting items, and killing an ever more powerful string of monsters, and those who just love four-player co-op with friends. If you are either of these (or both), you'll probably get a lot out of Final Fantasy Explorers. However, if you are looking for an epic plot or can't handle a sub-par battle interface, you're safe sitting this one out. Final Fantasy Explorers was released in Japan for the Nintendo 3DS on December 18, 2014. There is currently no word on an international release.